Do you have an account with Andhra Bank? Do you remain updated with the account transactions? It is the responsibility of every account holder to keep the track record of the transactions and available account balance. It is not always possible to visit the bank for passbook printing. Many account holders even don't have access to online banking facilities. There is another option of checking the account balance by visiting the ATM and using the debit card for balance enquiry. What if you want to check the balance immediately when you don't have access to any of the available options? The Indian banking sector advanced highly after the introduction of technical facilities. 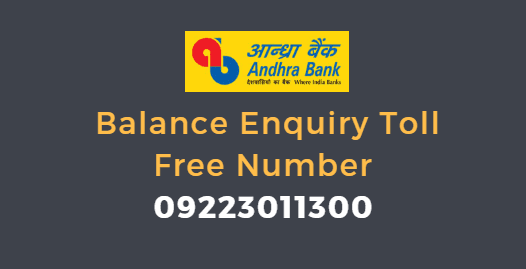 Now, you can check the available balance in the account by using the Andhra Bank balance enquiry number. Dial 09223011300 from your registered mobile number with saving account. If you don't have that number, visit a home branch and update new number. Give a missed call or disconnect the call after 2-3 rings. If you don't disconnect the call, it will disconnect automatically. You will receive SMS from the bank stating the available balance update. Important note: It is a toll-free number, and the bank will not charge for the call. You can access the service any time and from anywhere. The account holders with a registered mobile number can access the service. Within a few seconds, you will receive the account balance details via SMS. This service is available to customers who have registered mobile number for SMS alerts. Missed call service is highly helpful for account holders in a remote area or needs instant updates about the account.